The Czech economy is booming, and the unemployment rate is the lowest in the European Union. That means many companies are looking to fill positions. Brno, the country’s second-largest city, has become a high-tech hub with many multinational companies in need of people with language skills. 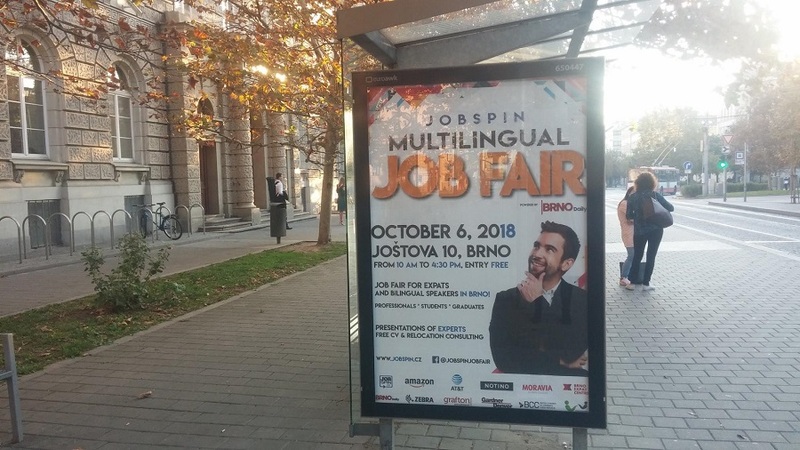 JobSpin Multilingual Job Fair Powered by Brno Daily takes place Oct. 6 at the Faculty of Social Studies of Masaryk University from 10 am to 4:30 pm. Photo credit: JobSpin. People should bring CVs or résumés and be prepared to discuss openings with company representatives. The fair will also have free consulting panels. “Trained recruiters will help you to polish your CV and also with interview preparation,” she added. “We are also preparing a special program where relocation experts and company representatives will be holding a series of presentations,” she added. Topics will include the ups and downs of expat life in Brno, in addition to practical issues. The schedule of the panels and discussions can be found on the JobSpin website. “Print out your CV, come to JobSpin Job Fair and meet your future career,” she said. The fairs are free of charge for all bilingual and expat job seekers. People can register in advance online (register here). Sectors that will, in particular, have opportunities are IT, logistics, HR and recruiting, marketing, tech support, engineering, customer service, administration, accounting and finance, sales, journalism, and copywriting. Exhibitors announced so far include Amazon, AT&T Global Network Services, Zebra Technologies CZ, Grafton Recruitment, Gardner Denver, Notino, RWS Moravia, Oracle NetSuite, Global IT Center, Infosys, Brno Expat Centre, Foreigners Brno, JobSpin, Brno Daily, AIESEC, Czech Courses Brno (language studio). If you are not in Brno, there will be a similar event in Prague called JobSpin.cz Multilingual Job Fair Powered by Prague.TV on Nov. 3. Unemployment in the Czech Republic in the second quarter of 2018 was 2.2 percent, according to the Czech Statistical Office (ČSÚ). The Ministry of Labor and Social Affairs uses different methodology and for August said the unemployment rate for the country was 3.1 percent, with Brno at 4.6 percent and Prague at 2.2 percent. Speaker: Vanja Stojkovic, Customer Centre Training Team Leader at Notino, s.r.o. – What skills do employers look for? Speaker: Sam Beaton, Recruitment Consultant at Grafton Recruitment, s.r.o. Participants: Daria Somova and Jan Kalina – Relocation Experts, founders of Move To Prague, six years in the business; Sergio Bellini, owner of the restaurant “Castellana Trattoria” in Brno, Italian expat and candidate in municipal elections in Brno-center district (Piráti); Marie Knapp, founder of Czech Courses (2011), Czech language school for foreigners. For more information visit the official website of the JobSpin Job Fair or the Facebook page.